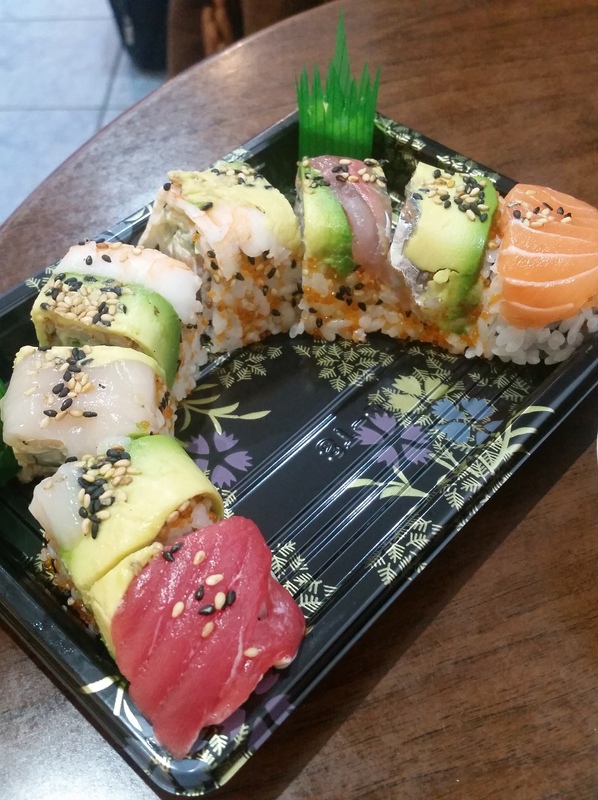 the james street branch of atari-ya is the perfect post-shopping sushi stop. located literally a stone’s throw away from selfridges and operating largely as a takeaway shop, it occupies a space just large enough for a sushi counter and a handful of 2-seater tables. this picture was taken at lunchtime on a monday afternoon and as you can see, it gets pretty crowded (with plenty of asians no less; #signsoflegitimacy), so its best to get there early. we reached at noon and were happy we did because as we very happily savoured our slivers of fish, we heard people being told that they would have to wait half an hour for their food to be prepared. i hereby present to you the best chirashi bowl i have had on this side of the world, by far. by best i mean that it has the winning combination of extremely fresh fish and a wonderfully generous portion – amazingly value-for-money and guaranteeing satisfaction. £16.50 may sound steep for a hole-in-the-wall takeaway shop like that, but you soon learn that the price is warranted (or more than warranted, i dare say) as each bowl of this super deluxe chirashi comes brimming with tuna, salmon, horse mackerel, sea bass, sea bream, boiled prawn, sweet prawn, crab stick, crab meat, scallop, vinegared mackerel, ikura, tobikko, negitoro (or uni aka sea urchin, depending on what is available that day), tamago, and some other stuff which i couldn’t quite identify but were delicious anyway. not only is the fish extremely fresh, smooth and naturally sweet, the slices are of just the right thickness such that they retain a satisfying bite and facilitate maximum appreciation of their goodness. 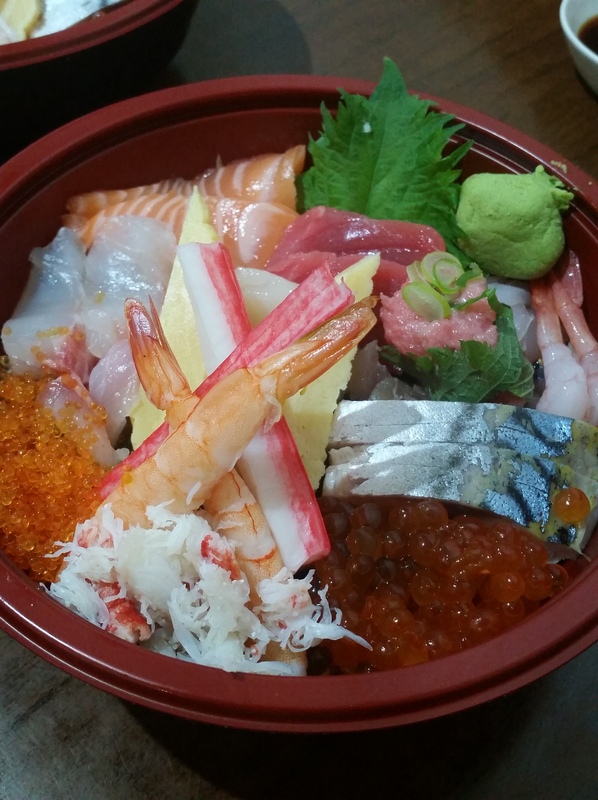 of course the star of any chirashi bowl is the fish but the rice here is also worth mentioning. dressed in eel sauce and topped with a sprinkling of an assortment of pickled toppings such as mushrooms, it was a great accompaniment to the fish. we also ordered a rainbow roll to share between us. the sushi rice was lovely – soft, moist and held its form very well even when i bit half the sushi rather than devoured the whole thing (good things ought to be slowly savoured). once again, the fish in the rolls was top quality and toppings to rice ratio was golden. PS. they have other outlets and they are proper sit-down restaurants so if you’re looking for somewhere with better ambience, you might want to head there instead. check them out here.